I work in a tile/flooring place. I see lots of cool things, and I want, I want, I want! I have a hard time making up my mind. 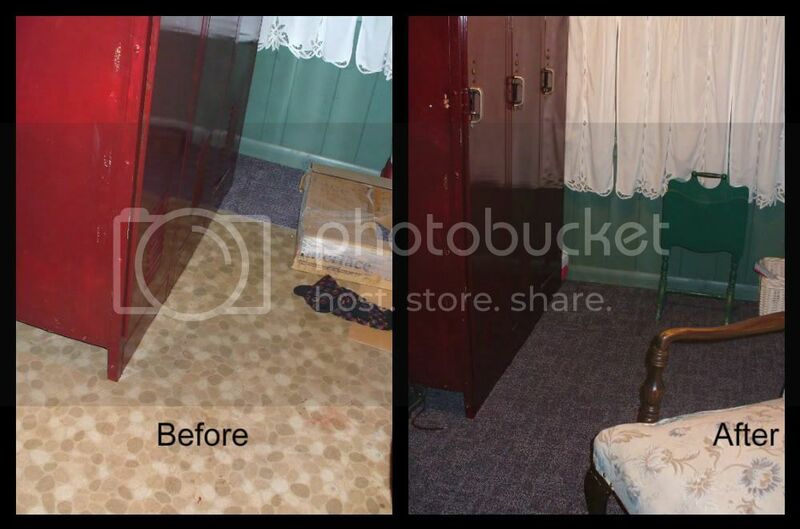 Carpet tile was always in the back of my head, as something I wanted to put in my front porch. 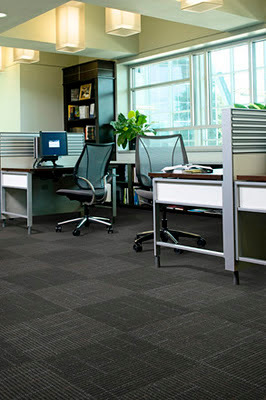 The commercial type of carpet tiles we primarily install in large office type areas. The attraction: It is durable, easy to clean, it will NEVER unravel, it is spillproof, has a heavy rubber backing, does not require underpad, office chairs roll over it with ease, it will not squish down in heavy traffic areas, and can handle dampness & soiled shoes. Due to the heavy rubber backing, the soil will not seep through the carpet, so when you vacuum it, it really does get clean! Best of all, if a tile gets damaged, just make sure you have an extra few, and you pull 1 up, and replace it! Installation: It comes in a box, (tiles are around 20"x20") not a roll so it is easy to transport. It can be loose laid in smaller areas, glued down with a tacky glue, (for ease of replacing a tile), or you can apply tape to attach the 4 corners of 4 adjacent tiles together. Due to the fact it is so easy to handle, it makes it a dream for a DIY'er! Design: It is completley customizable! 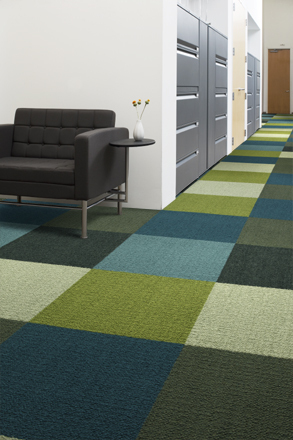 You can do 2 colors in a checkerboard pattern, linear stripes down a room, a striped carpet tile can be laid all in the same direction, or alternate directions. the perimiter of a room can have a border. The possibilities are endless! My Porch: So, my front porch has seen better days. It has its tidy moments, it has its untidy moments. It is the room where everyone comes in, and "drops" things. I was tired of the 1960's "pebble look" flooring. The porch currently has 1980's "hunter green" paint, which covers the panelling, & ceiling. (The paint stays till spring) I have a beautiful church pew in there somewhere! & I installed it myself! Without screwing up! I, me, moi! I did it! I have never installed tile, or carpet...ever. It was so easy, any chump can do it! I am WoMaN! Hear me roar. A very proud moment for me. I love the carpet tiles. You did an excellent job on the installation! Linking from Mod Vintage Life. 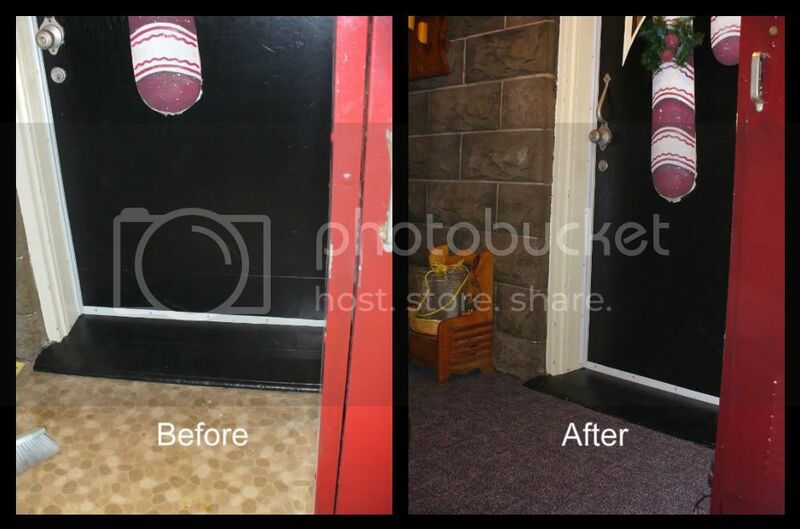 An even and properly maintained tiled carpet flooring looks appealing. It shows that you pay attention with all the details of your home. 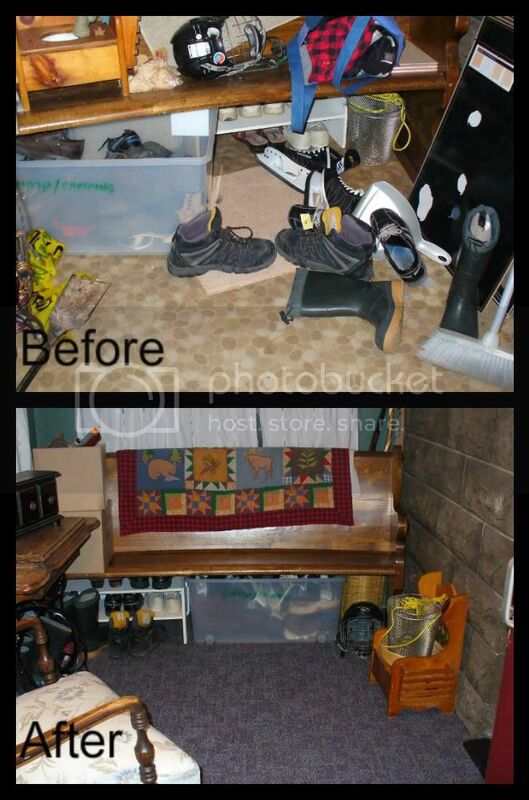 The given photos above show the great improvement after a makeover project, thank your for sharing! The flooring completes the overall appeal of a room. 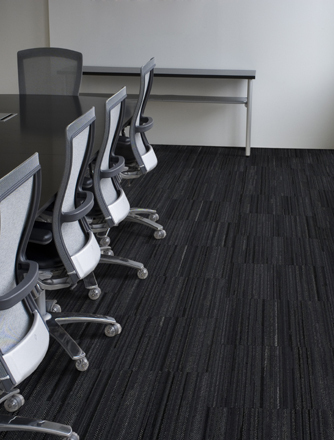 The chose type of flooring should not only look attractive but of quality materials as well to be able to withstand foot traffic or heavy impact.